WW2 Defences - Suffolk: 6 pdr anti-tank gun pit? Came across this earthwork at Westleton walks today and am wondering if it is a gun pit for the six ponder antitank gun (which replaced the 2 pdr). The main pit is approx 90" wide (7.5 ft) by approx 72 " (6 ft), with two 'arms' running off at an angle (approx 100"). Each arm is approx 16" wide and ends with a wider rectangle approx 24"x15". The rear is ramped down into the main pit. The pit is 2 ft deep with the spoil used to build up a parapet approx 60" wide at its widest point which adds approx an extra 8" cover. I don't have any measurements for the six pounder so cannot say whether it would fit or not. As with all earthworks at Westleton, would have been dug for training. Below: A photo of the pit and 'arms' outlined in red. The parapet is outlined in green. 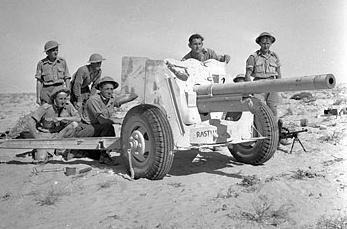 Bottom photo - a 6 pdr in use in the desert.